Wellmont Health System no longer has partial ownership of a private plane, but federal flight records reveal when it did, that plane traveled to the St. Louis area at least 57 times since 2010. Wellmont sold its share of the plane around the same time former CEO Denny DeNarvaez abruptly resigned. The health system previously said the sale and the resignation were not connected. At our request, the Federal Aviation Administration provided us with the plane's flight records. Those public records reveal since 2010, the plane flew from Tri-Cities Regional Airport to St. Louis 57 times, with most of the flights occurring on Mondays, Thursdays and Fridays. Those flights account for almost 12% of all of the plane's flights from the Tri-Cities during that time and the numbers do not include the 59 trips from St. Louis back to TCRA. When reached by phone for comment Tuesday, DeNarvaez continued to maintain the plane was used efficiently and per company policy. "I was not taking the plane for reasons that were for me," DeNarvaez said. "I was taking the plane for the reasons of company business. It's been well reviewed, audited, under compliance, you name it. The board has so fully looked into this." Although several top executives at Wellmont had personal ties to St. Louis, DeNarvaez maintains Wellmont had business reasons to be there. "We had several vendors in St. Louis," she said. She continued to say on the rare occasions her husband traveled with her, she covered the taxable fringe benefit. Wellmont was one of six owners of the plane, so there is no way to tell for sure who was on the plane when it was in the air. The plane flew from the Tri-Cities to St. Louis more than anywhere else except for Teterboro Airport in the New York-New Jersey area. Records reveal the plane traveled there 63 times. "Wellmont Health System has strong policies and practices in place for audit and compliance that apply to every level of our organization," the organization said in a statement. "Those policies and practices were applied to usage of the plane, in which Wellmont no longer has an ownership interest, and they are applied to every aspect of our business. These issues have been covered sufficiently, and there is nothing new to discuss. Questions being asked about our former CEO don't relate to the current business concerns of Wellmont, as she has not been employed by the health system for nearly two months now. Wellmont is keenly focused, under the leadership of our interim president and CEO, on the delivery of superior care with compassion to our patients and on the bright future of our organization." The Josephine County Board of Commissioners is poised to approve a 30-year lease that would inject more than $18 million into the local economy and perhaps as many as 200 jobs. The vote on Wednesday night will open the door for Manor Communities Development, which has a history of development projects in the Cave Junction area, to begin building custom facilities for several unnamed aeronautical system manufacturers on land at Illinois Valley Airport. A majority of the $18 million will be in the form of credits for upgrades and improvements at the airport, but even if all of the credits are alloted, the county will still receive $5.5 million in revenue over the life of the lease. "They have several major tenants that are either very interested or are verbally committed," County Airport Manager Larry Graves said. Graves said Manor will build to suit the needs of tenants it has recruited. All of the potential tenants will be related to the aeronautical industry, including at least one research and development company, a pilot-training company and a manufacturing company. Between the various tenants and the requirements for maintenance, operation and repair, there could be as many as 200 jobs. The focus will be on building unmanned aerial systems for nonmilitary and nongovernment use. Graves said the end products will be for strictly commercial sales. "There won't be drones flying over marijuana grows," he said. The lease, which runs from Jan. 1 through Dec. 31, 2045, calls for a $174,740 payment to the county in the first year, with escalating payments up to $642,904 in the fourth year. The annual rent will be $642,904 each year from that point through the end of the lease, but Manor can receive credits by making improvements at the airport. In fact, Graves said two-thirds to three-quarters of the payment will be in the form of credit for infrastructure improvements such as a new water system, new electrical system, a taxi way to connect existing taxi lanes, an airport ramp area, a septic handling system and completion of an industrial park at the airport. Those improvements are expected to lead to even more commerce at the airport. Larry Osborn, the founder of Manor Communities, has already signed the agreement, which will provide Manor the use of nearly 74 acres at the airport. Manor has offices in Grants Pass, Las Vegas and Lodi, Calif. Osborn has been involved in several projects in the Illinois Valley, including home developments, a medical facility and an unsuccessful attempt to buy Laurel Pines Golf Course. The possibility of a deal surfaced in the spring, Graves said, when County Commissioner Simon Hare told him that the county had been approached about leasing property at the airport. "Over the course of the summer and the fall, we fleshed out what they are intending to do," Graves said. "I'm very hopeful and positive and looking forward to the future." The meeting is scheduled to begin at 5 p.m. at Anne Basker Auditorium, 604 N.W. Sixth St., Grants Pass. NEWPORT NEWS -- Newport News International Airport officials have told PEOPLExpress to pay $100,000 in overdue fees or vacate the terminal building, a spokesman told 13News Now Monday. According to airport spokesman Ken Spirito, the airline didn't pay passenger facility charges for July, August and September. The airline was first given notice 30 days ago, he said. The $4.50 fee, according to Spirito, is included in passenger's ticket prices and returned back to the airport for capital improvements. Spirito called today's notice a formality because the airline isn't currently operating at the airport. PEOPLExpress temporarily suspended flights in September due to aircraft and crew availability and maintenance issues. PEOPLExpress told 13News Now they had no comment. Stay with 13NewsNow.com for more on this developing story. The Directorate General of Civil Aviation is probing how repeated distress calls were made from a private Airbus 319 owned by India's wealthiest man, Mukesh Ambani, when it was not even air-borne. On Monday night at 8.32 pm, Mumbai Air Traffic Control's main tower received a Mayday alert. Even before the ATC officials could understand what was happening, they received another Mayday call six minutes later at 8.38 pm. Mayday is the code used internationally to signal distress or life-threatening situation. The first call to the Surface Movement Control of the ATC reported that the engine was on fire and that the aircraft was in rapid descent. The plane, the pilot said, was on a Delhi-Lahore-Muscat route. By the time the ATC identified the aircraft by its unique registration number as belonging to Mukesh Ambani, came the second distress call which repeated that the engine was on fire and the Airbus was ditching into the sea. (See below). "We contacted the air traffic controls of Delhi and Muscat if they reported an emergency. We also checked with planes flying in that zone if they could see any aircraft with its engine on fire," said a senior ATC official. When Delhi and Muscat both reported that all operations were normal, and the other planes reported no unusual sighting, the ATC shifted its attention trying to locate the radio frequency of the Airbus from where the distress signals were coming. To their surprise they found the source of the call pointing towards not somewhere up in the sky but the southwest of the airport where the hangars for private jets are. "We sent a team to verify the aircraft parked there," said the official. The team found the Airbus - the same aircraft that had been gifted by Mukesh Ambani to his wife Nita for her 44th birthday in 2007 - in the hanger but there was no one inside the aircraft. The ATC team after confirming the plane to be the source of the distress calls reported the incident to the Directorate General of Civil Aviation which started its investigation on Tuesday. According to ATC officials, pilots and maintenance crew routinely check emergency radio systems but "they always notify us in advance so that there is no panic or confusion but that was not done in this case." The entire operation took two hours before calm was restored. "Initial investigations show the pilot was probably checking whether the emergency systems and the radio were functioning. But he forgot to inform the ATC that he was conducting these tests," said a senior DGCA official, close to the investigation. The maintenance of the Ambani Airbus jet is done by Jet Airways with the help of in-house Reliance engineers. A Jet Airways source corroborated that the pilot was testing the emergency radio systems when the incident occurred, while the aircraft was on ground. Reliance spokesman Tushar Pania also confirmed that the emergency systems were being tested. He, however, said that all the relevant authorities were informed. "It was a regular mock drill to test the emergency systems and the ATC and the DGCA were informed," he said. The Rs 242-crore aircraft was gifted by Mukesh Ambani to his wife Nita in 2007. It is one of the biggest private jets in the country, the other one is owned by beleaguered UB chief Vijay Mallya. The jet is custom-fitted with an office and a cabin with game consoles, music systems, satellite television and wireless communication. It also has a master bedroom, a bathroom with a range of showers and a bar with mood lighting. The aircraft emergency frequency (also known as guard) is a frequency used on the aircraft band reserved for emergency communications for aircraft in distress. The frequencies are 121.5 MHz for civilian, also known as International Air Distress (IAD) or VHF Guard. Although the Ambani aircraft used 121.9, the ATC can assign any frequency as emergency or distress. SAN FRANCISCO— Google Inc. has signed a long-term lease for part of a historic Navy air base, where it plans to renovate three large hangars and use them for projects involving aviation, space exploration and robotics. The Internet company will pay $1.16 billion in rent over 60 years for the property, which also includes a working airfield, golf course and other buildings. The 1,000-acre site is part of the former Moffett Field Naval Air Station on the San Francisco Peninsula. Google founders Larry Page and Sergey Brin have a well-known interest in aviation and space. The company recently acquired several smaller firms that are working on satellite technology and robotics. But a Google representative declined Monday to discuss specific plans for the property, which is located a few miles from the company’s main campus in Mountain View. NASA plans to continue operating its Ames Research Center on the former Navy site. Google will take over operations at the runways and hangars, including a large structure that was built to house dirigible-style Navy airships in the 1930s. NASA said the deal will save it $6.3 million in annual maintenance and operation costs. Google already has a separate lease for another portion of the former air base, where it wants to build a second campus. Messrs. Page and Brin also have used the Moffett runways for their collection of private jets, under another lease arrangement that has been criticized by some watchdog groups who say NASA gave the executives a sweetheart deal. American Airlines Group Inc. won’t try to add seats to the largest jets flown by its regional carriers, saying it’s more important for new management to build trust with pilots than to increase revenue. The move means American will stick with planes carrying no more than 76 people, instead of increasing to the 81 seats the airline preferred, American President Scott Kirby said today in a letter to pilots. Planes with more seats must be flown by American’s mainline pilots, not its commuter partners. “It seems the reason it is difficult to convince our pilots that this change is in their best interest -- and not some nefarious scheme to harm them in some way -- is because the pilots of American do not fully trust management,” Kirby said. Dropping that plan will cost American “tens of millions of dollars” annually, he said. American made the offer to pilots two days after flight attendants rejected a tentative contract that would have been the first to include workers from merger partner US Airways. 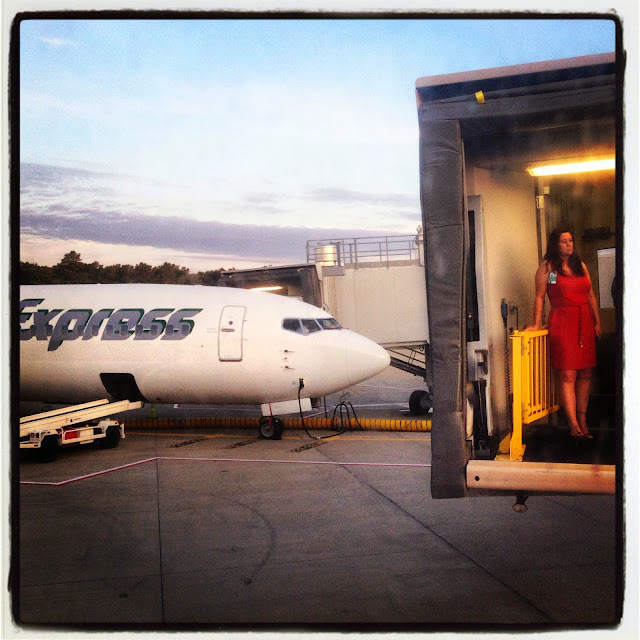 A 76-seat limit for jets at regional airlines is an industry standard. Any increase threatens the jobs of mainline pilots who fly bigger planes, unions have said. The Allied Pilots Association declined to comment on the regional jet proposal until its board can be briefed on American’s offer at a meeting tomorrow, said Dennis Tajer, a union spokesman. Kirby is part of the former US Airways management team that took over American when the two airlines merged in December. The Fort Worth, Texas-based company is negotiating a single contract to cover pilots from both carriers. The APA and previous American management failed to negotiate a contract in more than five years of talks, finally agreeing on terms in bankruptcy. A legal battle kept US Airways from merging two pilot groups for years after it combined with America West. American’s offer would give its pilots the highest pay rates among its major network peers, Kirby said, without providing other details. The tentative agreement with the Association of Professional Flight Attendants was rejected Nov. 9 by a margin of 16 votes out of more than 16,000 cast. American and the union will begin arbitration hearings for a new contract on Dec. 3, the APFA said. Could daily air service be coming to the Youngstown-Warren Regional Airport (KYNG)? VIENNA, Ohio - The Western Reserve Port Authority is waiting to hear whether daily air service will be approved between the Youngstown-Warren Regional Airport and Chicago, according to Dan Dickten, Director of Aviation. Final approval would need to come from the U.S. Department of Transportation, and that could happen in the next week or so. Dickten has predicted that more than 125,000 passengers will fly in-and-out of the airport this year. The service would allow air travelers from Youngstown to reach destinations worldwide by way of Chicago. Steamboat Springs — Routt County Manager Tom Sullivan said Monday that he has firmed up plans to fill the role of interim manager at Yampa Valley Regional Airport early this ski season himself. Sullivan has begun the search for a replacement for former YVRA manager Dave Ruppel, who resigned effective Nov. 5 after nine years here to accept a similar role at Front Range Airport east of Denver. Sullivan previously told the Steamboat Today that he does not expect to have a replacement for Ruppel in place before Christmas, meaning the airport will be without a full-time chief administrator during one of the busiest periods of the ski season for YVRA. Ruppel’s resignation, which was driven by the need to be closer to his wife and son living on the Front Range, came about two months after the retirement of Assistant Airport Manager Dean Smith in August. The county already had decided not to replace Smith for austerity reasons. Sullivan added that he met with officials of Steamboat Ski and Resort Corp. last week to let them know about the county’s plans. Commissioner Doug Monger said he has faith in the abilities of Maintenance Superintendent Todd Dubois, who is the lead manager taking care of air side snow removal, and of Airport Rescue and Fire Fighting/Public Safety Director Tyler Whitmore, a veteran in that role. The same is true, he said, of Business Manager Doris Mayhan, who will oversee airport contracts until a new airport manager is in place. “I think we’re going to be fine,” Monger said. Dubois appeared before the commissioners Monday to gain approval for a replacement part on a backup motorized sweeper that is used to clear light snow from the runway at the airport. Monger pointed out that most of the airport functions that relate directly to passenger experience are handled by the airlines and rental car companies, for example. When flights into Steamboat don’t operate and ground transportation to Denver International Airport or Walker Field in Grand Junction must be arranged for passengers, the airlines handle those details. However, Sullivan said he does have a backup plan. He told the county commissioners that former longtime Pitkin County manager Hilary Fletcher works in community planning for Jviation, the engineering firm that consults on long-range planning and FAA construction projects at YVRA. She is available to fill in temporarily at YVRA, with Jviation billing a daily rate, if the need arises, Sullivan said. “That’s who I’ll call if I have a problem,” he said. Hayden does not typically experience the full brunt of the harshest winter storms that impact Steamboat Springs, but should a major storm impact the airport, Sullivan said he anticipates the entire community would respond to the needs of stranded travelers. The reality, according to a FAA document obtained by POLITICO: The pilot said his close encounter was with a remote-controlled model plane — apparently of the type hobbyists have been flying for decades. The FAA is still investigating the incident, which might indeed have posed a risk to the passenger jet. But the newly released record offers a reminder that not everyone agrees on what is meant by the word “drone,” a term that can encompass anything from a toy quadcopter to a military weapon — complicating the debate about whether, and how, federal authorities should regulate their use in the civilian skies. The March 22 incident near Tallahassee, Fla., came to light in May when Jim Williams, head of the FAA’s Unmanned Aircraft Systems office, presented it as a cautionary tale during a speech at a drone business expo in San Francisco. He used that incident, and anecdotes about wayward drones injuring people on the ground, as reasons for the need for his agency to write regulations on standards for the unmanned craft. Though drones can be small, the consequences of ingesting even something the size of a goose into an aircraft engine can be disastrous, especially during takeoff or landing. “Imagine a metal and plastic object, especially with [a] big lithium battery, going into a high-speed engine. The results could be catastrophic,” Williams said in his address, which The Associated Press quickly picked up on. Soon, the incident was leading CNN’s website for hours. The episode was among the first well-publicized accounts of a drone almost colliding with a passenger airplane. But according to the FAA’s preliminary near-midair collision report, which POLITICO obtained under the Freedom of Information Act, the offending object may not have been a drone at all, but rather a remote-control hobbyist aircraft. The flight instructor and private pilot were conducting an instructional flight. A witness reported that, when the airplane about 400 ft above the ground, he heard a “surging” sound coming from the engine and observed pitch and roll oscillations occurring; he then lost sight of the airplane. A video provided by the fixed-based operator showed the airplane take off and begin to climb. Shortly after, it recorded a radio call on the common traffic advisory frequency indicating that an emergency existed and that the airplane was returning to the airport. Another witness reported seeing the airplane’s landing gear barely clear a building as it flew toward the airport. He added that, as the airplane neared power lines, the airplane pitched up, likely in an attempt to avoid them. The airplane then collided with a telephone pole and unmarked transmission lines, which ruptured the fuel tank, and then struck the ground. A postcrash fire ensued that nearly consumed the cockpit, cabin, and both wings. Examination of the flight controls and heat-damaged engine revealed no evidence of preimpact failures or malfunctions. Examination of the manifold valve revealed that the inlet and outlet ports were blocked to varying degrees. Analysis of the blockage material determined that it was an organic polymer material consistent with polyester; however, the source of the contamination could not be determined. Although the blockages of the inlet and outlet ports precluded postaccident flow testing of the manifold valve, it is likely that the blockages resulted in the surging reported by the witness and the subsequent loss of engine power. The blockages likely would not have created a condition that would have been detectable to the pilots during the pretakeoff engine run-up. Although the fuel vent lines of both wings were found blocked with organic material consistent with insect nest material, the accident flight was very short and, therefore, it is unlikely that these blockages affected the engine operation. The blockages of the fuel vents were located in an area that would not have been visible to the pilots during the preflight inspection of the airplane. The partial loss of engine power due to the undetected blockage of the inlet and outlet ports of the manifold valve by an organic compound of an unknown source. On October 16, 2014, about 1129 eastern daylight time, a Rockwell International 112A, N1148J, registered to and operated by a private individual, collided with a powerline pole, unmarked transmission lines, then the ground during a forced landing in Gainesville, Georgia. Visual meteorological conditions prevailed at the time and no flight plan was filed for the 14 Code of Federal Regulations (CFR) Part 91 instructional, local flight from Lee Gilmer Memorial Airport (GVL), Gainesville, Georgia. The airplane was destroyed by a postcrash fire and the flight instructor and private pilot were fatally injured during the flight that originated about 1 minute earlier. According to the airplane owner's next door neighbor, about 1 week before the accident the owner told him he would be flying from the right seat with a flight instructor on-board. A witness who was outside his hangar which is located south of runway 29 near the departure end of runway 29, reported that he observed the airplane flying at an estimated altitude of 400 feet, He heard a surging sound from the engine, and noticed oscillations of pitch and roll. The witness saw the airplane for about 3 to 4 seconds and then lost sight due to obstructions. He then heard a loud sound from the powerlines and heard the sound of impact followed by seeing smoke. He then ran to the sight, called 911 to report the accident, and when he arrived there were already 8 to 9 people on-scene. When he arrived the flight instructor was out of the airplane and on grass located north of the location of the wreckage. Another witness who was in a building located immediately west of the accident site reported to FAA seeing the airplane's landing gear barely clear the building as it flew in an easterly direction towards the airport. The witness heard a sputtering or popping sound from the engine but did not see any smoke trailing the airplane. The witness reported that as the airplane flew towards powerlines that were located east of the building, he observed the airplane pitch up, as if in an attempt to avoid them. A portion of a wing contacted a powerline pole, and then the airplane rolled and impacted the ground coming to rest inverted. The witness ran to the accident site and assisted the flight instructor from the airplane, and also attempted to rescue the other occupant but was unable. He then rendered assistance to the flight instructor until first responders arrived. The left seat occupant, age 50, held a commercial pilot certificate with airplane single and multi-engine land, instrument airplane ratings. A review of his Federal Aviation Administration (FAA) airman file revealed that on August 5, 2006, he received a FAA Form 8060-5, titled Notice of Disapproval of Application for the private pilot certificate. He subsequently passed on August 18, 2006. He also held a flight instructor certificate with airplane single engine, and instrument airplane ratings. He was issued a second class medical certificate with no limitations on September 10, 2014. On the application for the medical certificate he listed a total time of 4,100 hours, and 500 hours in the previous 6 months. His last flight review in accordance with 61.56 occurred on January 14, 2014. According to personnel of a fixed base operator, the left seat occupant began flying with them as a student pilot in 2005, and has been a flight instructor with them since 2008 or 2009. He was reported to be in good health, and the accident flight was his 3rd flight with the airplane owner flying from the right seat. A review of copies of the left seat occupant's pilot logbook that contained entries from June 28, 2014, to the last entry dated October 15, 2014, revealed that he logged flying with the owner in the accident airplane on October 1st and 6th, 2014. Both flight durations were recorded to be 1.2 hours and the remarks section of the first flight indicated, "Larry right seat", while the remarks section of the second flight indicated, "Larry Right Seat Landing." Excluding the accident flight, he logged a total time of 4,171 hours. The right seat occupant, age 74, held a private pilot certificate with airplane single engine land rating, issued December 13, 2005. A review of his FAA airman file revealed that 3 days earlier, or on December 10, 2005, he received a FAA Form 8060-5, titled Notice of Disapproval of Application for the private pilot certificate. The areas on the disapproval notice included takeoff's, landings, go-arounds, and ground reference maneuvers. On August 22, 2014, he was issued a third class medical certificate with a limitation that he, "Must wear corrective lenses for near and distant vision." On the application for the medical certificate he listed a total time of 711 hours, and 37 hours in the previous 6 months. A review of his 2nd pilot logbook that was found in the wreckage revealed his last flight review in accordance with 61.56 occurred on February 15, 2014; the flight review consisted of 2 hours of ground instruction and 1.1 hours of flight instruction. The airplane was manufactured in 1975, by Rockwell International as model 112, and was designated serial number 428. It was powered by a 200 horsepower Lycoming IO-360-C1D6 engine and equipped with a Hartzell constant speed HC-E2YR-1BF propeller with F766A blades propeller. Review of the maintenance records revealed the airplane was last inspected in accordance with an annual inspection on September 1, 2014. The airplane total time at the time of the inspection was 3,656.6 hours. Further review of the maintenance records revealed the fuel tanks were sealed last on March 17, 2006; at airplane total time of about 3,196.7 hours. The airplane's fuel system consists of an integral 25.0 gallon fuel tank in each wing, which routes fuel to the five-position fuel selector valve, fuel strainer or gascolator, electric (auxiliary) fuel pump, mechanical fuel pump, servo fuel injector, flow divider, to each fuel injector nozzle installed in each cylinder. Each wing contains a fuel vent scoop assembly part number (P/N) 48550-1) installed on the lower wing skin outboard of the integral fuel tank. The fuel vent scoop contains two openings; the first faces forward, while the second is parallel to the lower wing skin. Both openings at the fuel vent scoop have fittings that protrude inside the wing, and those fittings are connected to the fuel tank via flexible rubber hoses, aluminum lines, and fittings. Each fuel tank is also vented from a fitting on the fuselage that is connected by aluminum lines and fittings. A surface observation weather report taken at GVL at 1153, or approximately 24 minutes after the accident indicates the wind was from 280 degrees at 9 knots, the visibility was 10 statute miles, scattered clouds existed at 2,200 and 3,300 feet, and overcast clouds existed at 4,200 feet. The temperature and dew point were 14 and 09 degrees Celsius, respectively, and the altimeter setting was 29.92 inches of Mercury. The GVL Airport is equipped in part with runway 29, which is 4,001 feet in length and 100 feet wide. While the airport common traffic advisory frequency is not officially recorded, a fixed base operator on the field has security cameras that contain a portion of runway 29, and also record audio transmission from radio calls on the CTAF. A review of the provided video recording revealed that a portion of the takeoff was recorded, as well as a radio call from an occupant of the airplane. The video depicted the airplane when it was about 1/2 way down the runway in a normal climb attitude. The airplane went out of view of the camera, and a short time later, a radio call on the CTAF frequency was recorded by the FBO security system. The radio call indicated an emergency existed and advised the flight was returning runway 05. Approximately 2 seconds later, power to the video camera was shut off, which was attributed to impact to the power lines. The airplane crashed off airport; the main wreckage was located at 34 degrees 16.201 minutes North latitude and 083 degrees 50.226 minutes West longitude, or 0.28 nautical mile and 211 degrees from the departure end of runway 29. Examination of the accident site revealed the crash site was southwest of the intersection of Scott Street and Palmour Drive. Two powerline poles were broken; 1 pole immediately adjacent to the accident site and 1 pole near the intersection of Scott Street and Palmour Drive. The powerline pole immediately adjacent to the accident site was broken in three pieces (including a piece that was underground). Additionally, damage to unmarked 7200KV three phase electrical wires oriented on a magnetic heading of 035 degrees was noted; the pole and wires were repaired before NTSB arrival, but the damaged components were retained at the accident site. Examination of the broken powerline that was immediately adjacent to the accident site revealed it was approximately 40 feet long, and was set approximately 6 feet below the ground. The pole was fractured at ground level and also about 25 feet above ground level. Pieces of white paint with green color on the opposite side and gouges were noted on the upper 40 inches of the pole, consistent with contact by a portion of the airplane. Wiring from the left Aeroflash Signal Box was found hanging on a telephone wire to the northeast of the broken powerline pole immediately adjacent to the accident site. Nearby businesses were contacted to determine if either contained security video that captured the accident sequence; no video depicting the accident sequence was recorded. Further examination of the accident site revealed ground scars on the road 53 feet 6 inches from the pole contact location. With an estimated pole contact located 31 feet 8 inches above ground level, the descent path to the ground was calculated to be approximately 59 degrees. The ground scar was oriented on a magnetic heading of 068 degrees. Examination of the wreckage revealed the engine, cockpit, and wing carry-thru were inverted. A postcrash fire nearly consumed the cockpit, cabin, and both wings. The outer 4 feet of the left wing was initially found on the sidewalk in the area of the powerline pole, but subsequently moved closer to the main wreckage before NTSB arrival. Examination of the left wing revealed the outer 4 feet was separated; the upper and lower wing skins exhibited sawtooth type fractured oriented in a spanwise direction. The separated section contained the outer portion of the integral fuel tank, and fuel vent lines. The full span of the aileron remained connected, and the aileron counterweight was in-place. The main landing gear was fractured, and the wheel assembly was damaged. The aileron control cables were connected the aileron bellcrank adjacent to the control surface and the pushrod was connected to the bellcrank and the remaining portion of the aileron. Examination of the separated outer section of left wing revealed the fuel tank vent lines were detached at both fittings of the fuel vent scoop assembly; both openings of the fuel vent scoop assembly were free of obstructions. Examination of the ends of the flexible hoses attached to each of the vent lines revealed both were free of obstructions at the opening. When air was blown into the separated forward oriented vent tube, a solid particle of debris exited the tube at the tank connection with force; the debris was collected. Additional air was applied and small particles of dust/dirt exited. Further examination of the forward oriented fuel vent line revealed tan colored debris adhering to the wall approximately 1.25 inches from the end, which obstructed part of the tube opening. Evidence of tan colored material adhering to the entire inner circumference was noted; the material was consistent with insect nest material. The lines were removed from the "T" fitting, and the 90 degree portion was inspected and found to be completely blocked by tan colored material. Examination of the right wing which was upright revealed it was fractured at the wing root, and bent up at about a 45 degree angle about 7 feet outboard of the wing root. The main landing gear was extended. The flap was attached at the inboard and outboard hinges, and the aileron was connected at the inboard hinge. A portion of aileron counterweight was found adjacent to the right wing. The aileron control cable was connected at the aileron bellcrank near the control surface. The fuel vent lines were found loose among the wreckage. The line that attaches to the tank fitting was fractured, but the fractured portion of line was recovered. The line and wing section exhibited extensive fire damage. Examination of the fuel vent lines associated with the right fuel vent scoop assembly revealed evidence of soot adhering to the exterior surfaces. The end openings of all three lines were free of obstructions. The aluminum line that connects to the forward fitting of the scoop assembly was disconnected from the "T" fitting, and black colored loose material including a round shaped object measuring 11/32 inch in diameter came from the line. The other fuel vent line at the "B-nut" at the "T" reduction fitting well downstream of the end of the hose was completed blocked by debris. The remaining identified portions of fuel vent lines were free of obstructions. Examination of the empennage revealed it was heat damaged. The right horizontal was bent up about 90 degrees approximately 2 feet outboard of the root, and also bent inboard 90 degrees. The left elevator remained connected at the inboard 2 hinges, and also the spar was attached at the outboard hinge, while the right elevator with trim tab connected remained attached at the inboard 2 hinges; the full span was accounted for. Both the left and right elevator trim tab actuators were connected by chains, and were symmetrically extended 2.125 inches, which equates to trim tab deflection of 6 degrees nose-up. Examination of the aileron, elevator, and rudder flight controls revealed control cable continuity was confirmed from each control surface to the respective cockpit control. The flap torque tube assembly with attached right arm assembly and portion of actuator screw was found loose in the wreckage. Examination of the actuator screw revealed it was extended 12 threads, which equates to flap extension of 8 degrees. One fuel vent check valve with attached fitting and section of hard aluminum line was found in the wreckage debris by the FAA-IIC. The check valve was inspected and photographed. No determination was made as to what tank the check valve was for. Disassembly examination of the fuel selector valve revealed it was positioned to both; no obstructions were noted internally of the ports. Examination of the engine was performed by a representative of the engine manufacturer with NTSB oversight. The engine, which sustained heat damaged associated with the postcrash fire remained partially attached to the aircraft firewall via the tubular engine mount, was removed for examination. Following removal of the cylinders, continuity of the crankshaft to the accessory case and valve train was confirmed. The engine-driven fuel pump, which remained attached to the engine was heavily fire damaged. It was removed and disassembled which revealed the diaphragms were destroyed. Both magnetos and ignition harness sustained fire damage that precluded operational testing. Examination of the lubrication system revealed the oil suction screen was absent of ferrous debris, and the oil filer paper media was charred, but was absent ferrous debris between the media pleats. Examination of the fuel injector nozzles revealed no blockage. Following examination of the engine, the servo fuel injector and manifold valve were retained for further examination. Examination of the propeller revealed the propeller spinner exhibited minimal damage. One propeller blade was loose in the hub, and 1 blade was bent aft with very course chordwise scratches on the blade face. 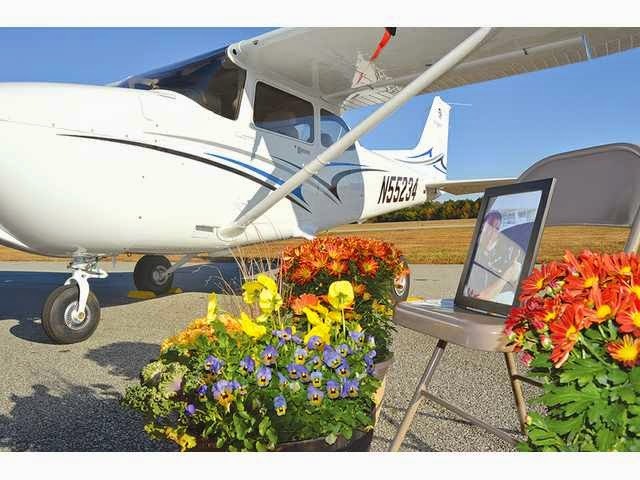 The flight instructor seated in the left seat was transported to a hospital for treatment of his injuries, but died while hospitalized on November 10, 2014. Because of the length of hospital stay, a postmortem examination and toxicology testing by FAA Bioaeronautical Sciences Research Laboratory was not performed. A postmortem examination of the right seat occupant was performed by Forensic Medicine Associates, Inc., at the DeKalb County Forensic Science Center. The cause of death was listed as "Blunt Force Head Trauma." Forensic toxicology testing on specimens of the right seat occupant was performed by the FAA Bioaeronautical Sciences Research Laboratory, Oklahoma City, Oklahoma. The toxicology report stated the results were negative for carbon monoxide, volatiles, and tested drugs, while testing for cyanide was not performed. Examination of the servo fuel injector revealed extensive heat damage which precluded operational testing. The fuel regulator plug which was safety wired was removed and the fuel diaphragm stem nut was observed to be in-place. Disassembly examination revealed the air diaphragm was heat damaged and the fuel diaphragm was destroyed. The plastic portion of the seat was destroyed, while the metal portion of the seat was in-place. Removal of the mixture control and fuel control section revealed ghost mark indicating the mixture was just off the full rich position. The clevis was broken to facilitate removal of the idle valve. Based on internal components of the servo, the throttle was in the wide open position. A detailed report concerning the servo fuel injector examination is contained in the NTSB public docket. Examination of the manifold valve revealed that the inlet fitting, inlet port and the ports of the valve body for each cylinder were obstructed to varying degrees by an unknown substance. Because of the obstructions, flow testing was not performed. Following removal of the cover from the bottom of the manifold valve, brown colored material was noted. The top cover of the manifold was removed and the fuel side of the diaphragm and housing were clean. The manifold valve was sent to the NTSB Materials Laboratory for analysis of the obstruction material. A detailed report concerning the manifold valve examination is contained in the NTSB public docket. According to the NTSB Materials Laboratory Report concerning the examination of the manifold valve, most of the portals had substance build-up that limited the openings to approximately half of the portal diameter or more. The blockages of each portal were estimated as follows: 45 percent and 75 percent for the inlet fitting and valve body opening, respectively; 60 percent for both the portal 'A' fitting and valve body opening; 70 percent for the portal 'B' valve body opening; 45 percent for the portal 'C' valve body opening; and 60 percent for the portal 'D' valve body opening. Samples of substances were taken from each port, along with the larger central opening of the back cover for testing by Fourier Transform Infrared (FTIR) spectrometer with a diamond attenuated total reflectance (ATR) accessory. Multiple FTIR analyses were performed on each portal sample, including the hard and soft areas of each sample, as well as areas of different colors for each sample. A spectral library search found the unknown material spectrum to be a very strong spectral match to several types of polyester-a type of organic polymer. Because the sample was degraded and the spectra for polyesters are so similar, it was difficult to differentiate between different types of polyesters. A copy of the NTSB Materials Laboratory Factual Report is contained in the public docket. On October 16, 2014, about 1129 eastern daylight time, a Rockwell International 112A, N1148J, registered to and operated by a private individual, collided with a powerline pole, unmarked transmission lines, then the ground during a forced landing in Gainesville, Georgia. Visual meteorological conditions prevailed at the time and no flight plan was filed for the 14 Code of Federal Regulations (CFR) Part 91 instructional, local flight from Lee Gilmer Memorial Airport (GVL), Gainesville, Georgia. The airplane was destroyed by a postcrash fire. The certified flight instructor (CFI) sustained serious injuries, while the private-rated pilot was fatally injured. The flight originated about 1 minute earlier from GVL. A witness who was outside his hangar which is located south of runway 29 near the departure end of runway 29, reported that he observed the airplane flying at an estimated altitude of 400 feet, He heard a surging sound from the engine, and noticed oscillations of pitch and roll. The witness saw the airplane for about 3 to 4 seconds and then lost sight due to obstructions. He then heard a loud sound from the powerlines and heard the sound of impact followed by seeing smoke. He then ran to the sight, called 911 to report the accident, and when he arrived there were already 8 to 9 people on-scene. When he arrived the CFI was out of the airplane and on grass located north of the location of the wreckage. Another witness who was in a building located immediately west of the accident site reported seeing the airplane's landing gear barely clear the building as it flew in an easterly direction towards the airport. The witness heard a sputtering or popping sound from the engine but did not see any smoke trailing the airplane. The witness reported that as the airplane flew towards powerlines that were located east of the building, he observed the airplane pitch up, as if in an attempt to avoid them. A portion of a wing contacted a powerline pole, and then the airplane rolled and impacted the ground coming to rest inverted. The witness ran to the accident site and assisted the CFI from the airplane, and also attempted to rescue the other occupant but was unable. He then rendered assistance to the CFI until first responders arrived. Examination of the accident site revealed the airplane crashed off airport property west of runway 5/23, near the approach end of runway 5. The engine assembly, cockpit, cabin, and empennage came to rest inverted; the cockpit, cabin, and both wings were nearly consumed by the postcrash fire. GAINESVILLE - A Gainesville man critically injured in a plane crash in mid-October has passed away. According to a post on the Lanier Flight Center Facebook page, Kelly Chandler died this week. The post featured a eulogy of Chandler. Funeral arrangements have not been announced at this time, the post said. Chandler was the passenger in a plane that crashed on Palmour Drive October 16. The 50-year-old was pulled from the wreckage by a passerby and suffered serious burns. The pilot, 74-year-old Lawrence Youhanian, died at the scene. Police are still investigating the crash, but Gainesville Police last reported that an initial report indicated a mechanical malfunction caused the pair to attempt to return to Lee Gilmer Memorial Airport when the plane crashed. This story will be updated as details develop. A memorial for flight instructor Kelly Chandler sits on the tarmac at Lee Gilmer Memorial Airport. 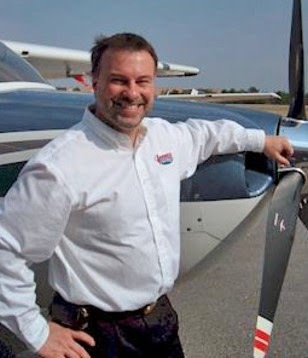 Chandler died Monday following an Oct. 16 plane crash that also killed pilot Lawrence Youhanaian. The passenger in an Oct. 16 plane crash just outside of Lee Gilmer Memorial Airport died Monday night, according to multiple sources. Lanier Flight Center instructor Kelly Chandler, 50, was traveling with Lawrence Youhanaian, 74, when the 1976 Rockwell Commander 112, piloted by Youhanaian, crashed on Palmour Drive, which circles the Gainesville airport. The pilot was pronounced dead at the scene, with Chandler pulled from the wreckage by a nearby mechanic. According to the line service technician who worked for the fixed-base operator (FBO), before taking off for the air ambulance flight with two medical crewmembers and one patient onboard, the pilot verbally asked him to add 40 gallons of fuel to the airplane, but the pilot did not specify the type of fuel. The line service technician drove a fuel truck to the front of the airplane and added 20 gallons of fuel to each of the multiengine airplane's wing tanks. The pilot was present during the refueling and helped the line service technician replace both fuel caps. Shortly after takeoff, a medical crewmember called the company medical dispatcher and reported that they were returning to the airport because smoke was coming from the right engine. Two witnesses reported seeing smoke from the airplane Several other witnesses reported seeing or hearing the impact and then immediately seeing smoke or flames. On-scene evidence showed the airplane was generally eastbound and upright when it impacted terrain. A postimpact fire immediately ensued and consumed most of the airplane. Investigators who arrived at the scene the day following the accident reported clearly detecting the smell of jet fuel. The airplane, which was equipped with two reciprocating engines, should have been serviced with aviation gasoline, and this was noted on labels near the fuel filler ports, which stated "AVGAS ONLY." However, a postaccident review of refueling records, statements from the line service technician, and the on-scene smell of jet fuel are consistent with the airplane having been misfueled with Jet A fuel instead of the required 100LL aviation gasoline, which can result in detonation in the engine and the subsequent loss of engine power. Postaccident examination of the engines revealed internal damage and evidence of detonation. It was the joint responsibility of the line technician and pilot to ensure that the airplane was filled with aviation fuel instead of jet fuel and their failure to do so led to the detonation in the engine and the subsequent loss of power during initial climb. In accordance with voluntary industry standards, the FBO's jet fuel truck should have been equipped with an oversized fuel nozzle; instead, it was equipped with a smaller diameter nozzle, which allowed the nozzle to be inserted into the smaller fuel filler ports on airplanes that used aviation gasoline. The FBO's use of a small nozzle allowed it to be inserted in the accident airplane's filler port and for jet fuel to be inadvertently added to the airplane. The misfueling of the airplane with jet fuel instead of the required aviation fuel, and the resultant detonation and a total loss of engine power during initial climb. Contributing to the accident were the line service technician's inadvertent misfueling of the airplane, the pilot's inadequate supervision of the fuel servicing, and the fixed-base operator's use of a small fuel nozzle on its jet fuel truck. On August 27, 2014, about 1903 mountain daylight time, a Cessna 421C airplane, N51RX, impacted terrain during initial climb near Las Cruces International Airport (LRU), Las Cruces, New Mexico. The pilot, two medical crewmembers, and one patient were fatally injured. The airplane was destroyed. 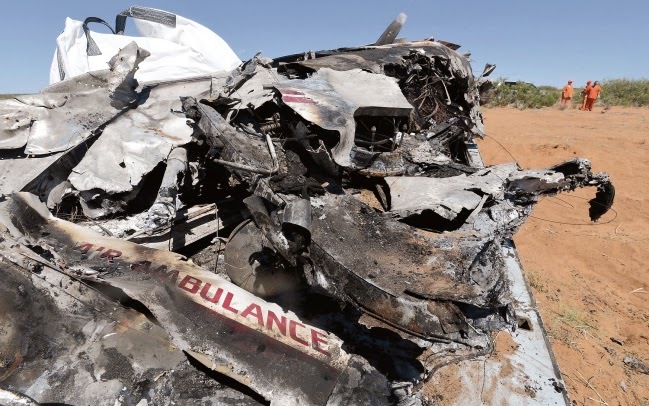 The airplane was registered to Elite Medical Air Transport, LLC, El Paso, Texas, and was operated by Amigos Aviation, Inc., Harlingen, Texas, as a 14 Code of Federal Regulations Part 135 air ambulance flight. Day visual meteorological conditions prevailed at the time of the accident at the accident site, and an instrument flight rules flight plan had been filed. The airplane departed LRU destined for Phoenix Sky Harbor International Airport (PHX), Phoenix, Arizona. The airplane arrived at LRU about 1822 to load the patient for a flight to PHX. According to the line service technician who worked for the fixed-base operator (FBO), both engines were shut down and the pilot was still seated in the cockpit when he asked the technician to add 40 gallons of fuel to the airplane; the pilot did not specify the type of fuel. The line service technician drove a fuel truck to the front of the airplane and then added 20 gallons of fuel to each wing tank. The pilot then helped the line service technician replace both fuel caps. The line service technician then printed the fuel ticket, which the pilot signed. At 1901:45, shortly after departure, a medical crewmember onboard the airplane called the company medical dispatcher and reported that the flight was returning to LRU because smoke was coming from the right engine. A witness driving on the interstate highway near the airport reported seeing the airplane flying about 200 ft. above ground level (agl) with smoke coming from the right engine. The airplane then began descending and entered a left turn. Another witness driving on the highway reported seeing smoke trailing from the airplane when it passed over him about 100 ft. agl. He saw the descending airplane continue to turn left and then lost sight of it. Several other witnesses reported seeing or hearing the impact and then immediately seeing smoke or flames. The pilot held a Federal Aviation Administration (FAA) airline transport pilot certificate with airplane single-engine land and multiengine land ratings. He also held an FAA flight instructor certificate with airplane single-engine, multiengine, and instrument airplane ratings. The pilot was issued an FAA first-class airman medical certificate with no limitations on October 28, 2013. The pilot's personal logbooks were not available for examination. Based on FAA records, pilot training documents, and other records from Amigos Aviation, the pilot's flight experience was estimated to be 2,432 total flight hours, of which 1,553 hours were in multiengine airplanes and about 1,379 hours were in Cessna 421 airplanes. The line service technician had been employed by the FBO since April 7, 2014. He stated that he had no previous work experience in aviation, he did not hold an FAA airman certificate of any kind, and he was not a pilot or an aircraft mechanic. FBO records showed he had completed its on-job-training program and been issued an American Petroleum Institute Class C training certificate. At the time that he refueled the airplane, he was the only FBO employee on duty. The low-wing, retractable-landing-gear, pressurized, multiengine airplane, serial number (S/N) 421C0871, was manufactured in 1981. It was powered by two 375-horsepower Continental Motors GTSIO-520-L turbo-charged engines. Engine S/N 292408 was installed on the left side, and engine S/N 292022 was installed on the right side. Each engine drove a three-bladed, variable pitch, full-feathering McCauley propeller. A review of the aircraft maintenance records showed that an annual inspection had been completed on March 5, 2014, at an aircraft total time of 8,181.4 hours and an hour meter reading of 869.6 hours. A maintenance logbook entry dated August 24, 2014, showed the hour meter reading was 904.3 hours. FAA records showed that the airplane had been registered to Elite Medical Air Transport, LLC since April 15, 2010. The airplane was equipped with Micro Aerodynamics vortex generators, which were installed in accordance with FAA-approved Supplemental Type Certificate SA5193NM. Preaccident photographs of the airplane showed labels near the fuel filler ports that had black letters on a white background and stated, in part, "AVGAS ONLY." A postaccident review of refueling records and statements from the line service technician revealed that the airplane had been misfueled with 40 gallons of Jet A fuel instead of the required 100LL aviation gasoline. The airplane was not equipped with, and was not required to be equipped with, either a cockpit voice recorder or a flight data recorder. At 1855, the automated weather observing system at LRU, located about 4 miles northeast of the accident location, reported wind from 040° at 5 knots, visibility of 10 miles, broken clouds at 6,500 ft., temperature 23°C, dew point 16°C , and an altimeter setting of 30.16 inches of m ercury. The airplane impacted desert grasslands operated by the United States Bureau of Land Management at a terrain elevation of about 4,420 ft. mean sea level. On-scent evidence showed that the airplane was generally eastbound and upright when it impacted terrain, which resulted in the separation of the left propeller blades and right aileron. The airplane came to rest inverted about 78 ft. east of the initial impact point on a wreckage debris path of about 93°, and an immediate postimpact fire consumed most of the airplane. The nose of the inverted fuselage was oriented to about 160°. All major components of the airplane were observed and accounted for at the scene. Investigators who arrived at the scene on the day following the accident reported clearly detecting the smell of jet fuel. Both engines, most of the left wing, the inboard portion of the right wing, and all of the tail surfaces remained attached to the fuselage. The right aileron was completely separated from the airplane and came to rest about 55 ft. to the southeast of the main wreckage. Control cable continuity was confirmed from the cockpit to the respective flight control surfaces except for cable separations consistent with either cable cuts by first responders or tensile overload. Thermal and impact damage prevented an assessment of any of the cockpit instruments. The left aileron trim actuator extension was measured, and it was about 1/4 inch, which corresponded to a setting of about 21° trim tab trailing edge down (airplane nose up). The left and right elevators remained attached to their respective horizontal attachment points. The right elevator trim tab remained attached to the right elevator. The right elevator trim actuator extension was measured, and it was 11/16 inch, which corresponded to a setting of about 21° trim tab trailing edge down. The rudder remained attached to the vertical stabilizer attachment points, and the rudder trim tab remained attached to the rudder. The rudder trim actuator extension was measured, and it was 2 1/4 inches, which corresponded to a neutral rudder trim position. Measurements of the flap mechanism corresponded to a flap extension of about 9° flaps down. All three landing gear assemblies remained attached and appeared to be in the retracted position. The left propeller hub remained attached to the left engine crankshaft propeller flange; however, all three propeller blades were completely separated from the propeller hub. The propeller blade marked as "1" was found 502 ft. southwest of the main wreckage; the propeller blade marked as "2" was found 285 ft. east of the main wreckage; and the propeller blade marked as "3" was found 55 ft. southeast of the main wreckage. None of the propeller blades exhibited significant twisting, leading edge gouges, or chordwise scratches; however, the outer 12 inches of the No. 2 blade was bent toward the camber side, and the outer 8 inches of the No. 3 blade was bent toward the camber side. The right propeller assembly remained attached to the right engine crankshaft propeller flange, and all three blades remained attached to the propeller hub. The propeller blade marked as "A" exhibited no significant twisting, leading edge gouges, or chordwise scratches. The propeller blade marked as "B" was melted into two sections about 16 inches from the blade root. The propeller blade marked as "C" exhibited no significant twisting, leading edge gouges, or chordwise scratches; however, the outer last 14 inches of the blade was bent toward the noncamber side. The fuel caps were found securely fastened to their fuel tank filler ports. The fuel caps were then removed, and it was observed that the filler ports had been modified with smaller restrictive inserts about 2 inches in diameter that would prevent insertion of a larger refueling nozzle. The engines were removed for further examination. The University of New Mexico Health Sciences Center, Office of the Medical Investigator, Albuquerque, New Mexico, conducted an autopsy of the pilot. The cause of death was listed as "thermal injuries, inhalation of products of combustion and blunt thoracoabdominal trauma." The FAA's Bioaeronautical Sciences Research Laboratory, Oklahoma City, Oklahoma, conducted forensic toxicology testing on specimens from the pilot. The toxicology report stated that no listed drugs were detected in urine. The toxicology testing detected 17 ml/hg ethanol was detected in the urine, and an unquantified amount of n-propanol was detected in the urine. No ethanol was detected in blood or liver. Such low levels of ethanol are likely produced postmortem, particularly when not detected in the blood. Examination of the left engine revealed that it exhibited significant fire and impact damage. The oil cooler, induction system, and intercooler were partially melted by the postcrash fire. All of the engine accessories were impact and thermally damaged. The right magneto case was melted, exposing the internal components. Both magnetos cases were melted, and only the rotating magnet remained attached to the engine. The fuel pump was thermally damaged and remained attached to the engine, and the drive coupling was intact. The alternator and propeller governor were thermally damage and remained attached to the engine. The remainder of the external surfaces of the engine exhibited varying degrees of impact and thermal damage. All of the internal components of the left engine exhibited thermal damage but no signs of lubrication distress. The cylinders exhibited heat damage and evidence of detonation. All pistons exhibited scuffing and heat signatures on the skirt. The Nos. 2, 5, and 6 pistons showed evidence of detonation on the face of the piston with portions melted away on the outer edge. The main and rod bearings exhibited normal operating signatures and thermal damage from the postcrash fire. The crankshaft, camshaft, gears, connecting rods, and reduction gears all exhibited thermal damage and normal operating signatures. The crankcase exhibited normal operating signatures and impact and thermal damage. The fuel system components were impact and fire damaged. The engine accessories were intact and exhibited thermal damage. Examination of the right engine revealed that it exhibited significant fire and impact damage. The induction system and intercooler were separated. All of the engine accessories were impact and thermally damaged. The right magneto case was melted, exposing the internal components. The left magneto remained attached but exhibited thermal damage. The fuel pump was thermally damaged and remained attached to the engine. The drive coupling was intact. The alternator and propeller governor were thermally damaged and remained attached to the engine. The remainder of the external surfaces of the engine exhibited varying degrees of impact and thermal damage. All the internal components of the right engine exhibited thermal damage due to the postcrash fire but no signs of lubrication distress. The cylinders exhibited heat damage and evidence of detonation. All pistons exhibited scuffing and heat signatures on the skirt. The Nos. 1, 2, and 5 pistons showed evidence of detonation on the face of the piston with portions melted away on the outer edge. The main and rod bearings exhibited normal operating signatures and thermal damage from the postcrash fire. The crankshaft, camshaft, gears, connecting rods, and reduction gears all exhibited normal operating signatures. The crankcase exhibited normal operating signatures and impact and thermal damage. The fuel system components were impact and fire damaged with portions melted away. The engine accessories were intact and exhibited thermal damage. Only portions of the induction system remained attached to the right engine; the remainder was melted away by the postcrash fire. Detonation is an uncontrolled, explosive ignition of the fuel/air mixture within the cylinder's combustion chamber. It causes excessive temperatures and pressures which, if not corrected, can quickly lead to failure of the piston, cylinder, or valves. In less severe cases, detonation causes engine overheating, roughness, or loss of power." Unless detonation is heavy, there is no cockpit evidence of its presence. Light to medium detonation may not cause noticeable roughness, observable cylinder head or oil temperature increase, or loss of power. However, when an engine has experienced detonation, we see evidence of it at teardown as indicated by dished piston heads, collapsed valve heads, broken ring lands or eroded portions of valves, pistons and cylinder heads. Severe detonation can cause a rough-running engine and high cylinder head temperature." According to FAA Advisory Circular (AC) 20-122A, "Anti-Misfueling Devices: Their Availability and Use," paragraph 6.1 , "Aviation statistics indicate that the use of improper fuel has caused or contributed to an inordinate number of accidents and incidents. Most of these have involved single-engine aircraft (and some multiengine) that were misfueled with jet or turbine engine fuel instead of gasoline, which these aircraft use. Misfueling a reciprocating engine-powered aircraft with jet…fuel can and has produced catastrophic results when engines failed during the critical takeoff phase of flight." Paragraph 6.3, states, "Fuel tank filler openings in reciprocating engine-powered aircraft may be equipped with pilot-installed adapter rings reducing the opening size from 3 inches to 2.3 inches in diameter. Jet or turbine engine fuel nozzle assemblies will be equipped with spouts with a minimum diameter of 2.6, thereby reducing the probability of introducing jet or turbine engine fuel nozzles into the filler openings of aircraft requiring gasoline." Paragraph 7.3, states, in part, "in the interest of safety and standardization, it is recommended that Fixed Base Operators…equip their turbine fueling equipment…with the larger size nozzles…to prevent misfuelling." According to FAA AC 150/5230-4B "Aircraft Fuel Storage, Handling, Training, and Dispensing on Airports," page 1, Paragraph 3, "Application," "This AC provides an acceptable means of complying with Title 14 Code of Federal Regulations (CFR) part 139 (hereinafter referred to as Part 139) for all Part 139 airport operators. Although non-certificated airports are not required to develop fuel standards, the FAA recommends these airports use the guidance contained in this AC to develop such standards for the continued enhancement of aviation safety." Page 7, chapter 2, paragraph 1, e, states, "14 CFR §139.321 (b) places the responsibility of determining standards for fueling safety on the individual airport based on state, local, or municipality fueling regulations. The FAA does not intend this AC to replace airport procedures that are tailored to meet requirements imposed because of the use of special equipment or as a result of local regulations." In 2005 , the Aircraft Owners and Pilots Association Air Safety Foundation issued Safety Brief Number 4 SB04-07/05, "Misfueling." The safety brief cautioned about the dangers of misfueling and recommended that pilots specify the fuel type and grade when ordering fuel, be present at the refueling and actively observe the fueling process, match the fuel truck color coding with the wing fueling decal, confirm that the fuel nozzle is compatible with the aircraft's fuel filler, and confirm that the fuel grade on the invoice matches the fuel grade ordered. The July/August 2006 issue of National Air Transportation Association's "NATA Safety 1st eToolkit," Page 1, "Aircraft Misfueling – A Continuing Threat," recommended that an effective misfueling prevention program should be adopted into the standard practices at all fueling operations and that the prevention program should include the following: "Training; Grade Confirmation; Written Fuel Order Forms; Grade Decals for Aircraft and Fueling Equipment; Selective Nozzle Spouts; and Fuel Receipt Quality Control Procedures." In March 2016, the NTSB issued a Safety Alert SA-050 "Pilots: Fueling Mistakes." The General Aviation Safety Alert cautioned pilots on the dangers of misfueling and gave several recommended preventive safety procedures. In March 2016, the NTSB issued a Safety Alert SA-051 "Line Personnel: Fueling Matters". The General Aviation Safety Alert cautioned line personnel on the dangers of misfueling and gave several recommended preventive safety procedures. In January 2017, the Energy Institute issued Publication EI 1597, "Procedures for Overwing Fueling to Ensure Delivery of the Correct Fuel Grade to an Aircraft," 2nd edition. The publication included recommended procedures for confirmation of the proper fuel grade, wing decals, fuel grade confirmation forms, use of selective nozzle spouts, fueling procedures, control of unattended fuelings, control of self-service fuelings, grade identification markings for refueling equipment, and training. 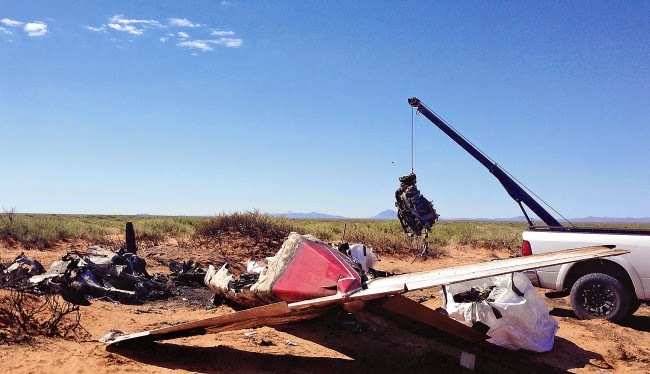 On August 27, 2014, about 1900 mountain daylight time, a Cessna Airplane Company 421C, multi-engine airplane, N51RX, was destroyed after impacting terrain during initial climb near Las Cruces International Airport (LRU), Las Cruces, New Mexico. The pilot, two medical crewmembers and one patient were fatally injured. The airplane was registered to Elite Medical Air Transport, LLC; El Paso, Texas, and was operated by Amigos Aviation, Inc.; Harlingen, Texas. Day visual meteorological conditions (VMC) prevailed at the time of the accident and an instrument flight rules (IFR) flight plan had been filed for the 14 Code of Federal Regulations Part 135 air ambulance flight. At the time of the accident the airplane was departing LRU for a flight to Phoenix Sky Harbor International Airport (PHX), Phoenix, Arizona. The airplane arrived LRU about 1834 to pickup a patient for a flight to PHX. The pilot was still seated in the cockpit when he gave the line service technician a verbal order for a total of forty gallons of fuel. The line service technician drove the fuel truck to the front of the airplane and refueled the airplane putting 20 gallons in each wing. The pilot then assisted the line service technician with replacing both fuel caps. They both walked into the office and the pilot signed the machine printed fuel ticket. After departing LRU to the west a medical crewmember onboard the airplane called their medical dispatcher on a satellite telephone and reported they were returning to LRU because of a problem with smoke coming from the right engine. A witness driving westbound on the interstate highway reported the airplane was westbound and about 200 feet above ground level (agl) when he saw smoke begin to appear from the right engine. The airplane then began descending and started a left turn to the east. Another witness, driving eastbound on the interstate highway, reported the airplane was trailing smoke when it passed over him about 100 feet agl. He saw the descending airplane continue its left turn to the east and then lost sight of it. Several witnesses reported seeing the impact or hearing the sound of impact and they then immediately saw smoke or flames. Evidence at the scene showed the airplane was generally eastbound and upright when it impacted terrain resulting in the separation of the left propeller and the separation of the right aileron. The airplane came to rest inverted about 100 feet from the initial impact point, and there was an immediate postimpact fire which consumed much of the airplane. Investigators who arrived at the scene on the day following the accident reported detecting the smell of jet fuel. A postaccident review of refueling records and interviews with line service technicians showed that the airplane had been misfuelled with 40 gallons of Jet A fuel instead of the required 100LL aviation gasoline. At 1855 the automated weather observing system at LRU, located about 3 miles northeast from the accident location, reported wind from 040 degrees at 5 knots, visibility of 10 miles, broken clouds at 6,500 feet, temperature 23 degrees Celsius (C), dew point 16 degrees C, with an altimeter setting of 30.16 inches of Mercury. 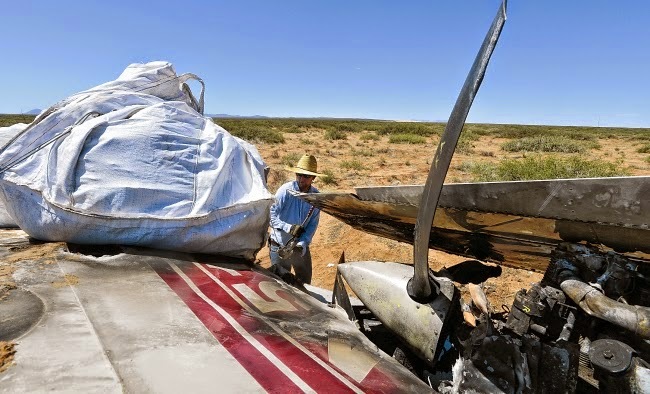 Plane crash >> Will the name of the technician who misfilled the twin-engine prop plane that went down after takeoff from Las Cruces International, killing all four on board, ever be publicly identified? At 1855 the automated weather observing system at LRU, located about 3 miles northeast from the accident location, reported wind from 040 degrees at 5 knots, visibility of 10 miles, broken clouds at 6,500 feet, temperature 23 degrees Celsius (C), dew point 16 degrees C, with an altimeter setting of 30.16 inches of Mercury.